This tasty and relatively easy recipe came from this fantastic cookbook centered on one of my favorite cuisines. The recipe calls for a mix of lamb and veal, but lamb alone would probably be good too. 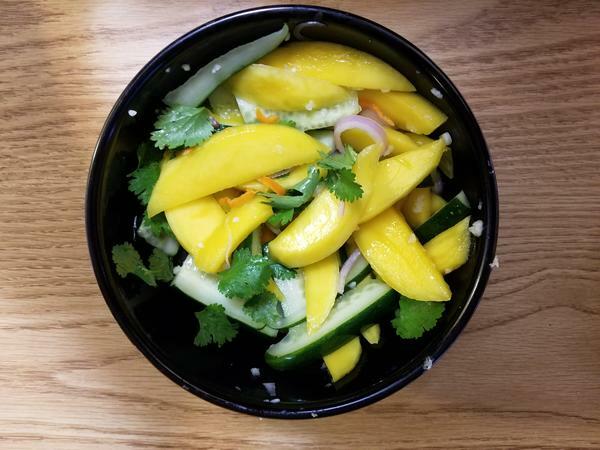 Billed as Caribbean by Bon Appetit, this mango chow could go equally well with Indian, Thai, or other South/Southeast Asian cuisines. Sweet, spicy, salty, and sour -- delicious! Courtesy of Cowgirl Creamery. Could easily be made vegetarian. My goodness was this delicious. You have to give Martha credit where credit is due. Adapted from a recipe we found online, this flatbread or pizza is easy to make and tasty. Cut it into small squares to serve at a party.